Samford University’s Orlean Beeson School of Education announced recipients of the 2017 Faculty Awards at its annual awards ceremony April 7. 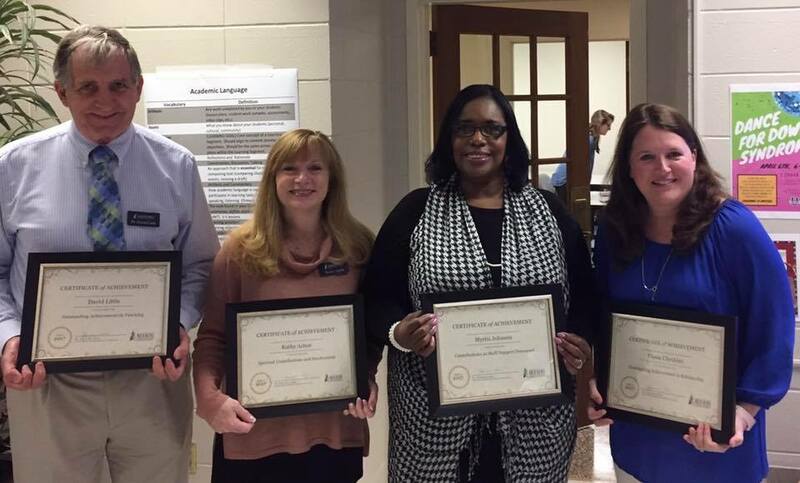 Education faculty and staff were recognized for outstanding contributions to the school and the field of education. Recipients were nominated by their colleagues. David Little, professor and director of the Fifth-Year Alternative Graduate Program in ECE/Elementary Education program, received the award for Outstanding Teaching. The award recognizes a full-time faculty member for outstanding achievements, innovations and/or performances in graduate or undergraduate teaching. Little also serves as a professor in the Instructional Leadership program and the undergraduate Secondary Education program. Diana Cheshire, associate dean, and Instruction and Design program director, received the award for Outstanding Scholarship. The Outstanding Scholarship award recognizes a full-time faculty member for outstanding achievements in research, publication or professional presentations during the current and immediately preceding two academic years. Cheshire’s primary research and professional development interests are assessment and accreditation, reform in K–16 education, mathematics education, computer-mediated learning, and instructional systems technology. Kathy Acton, alumni relations coordinator, received the award for Spiritual Leadership and Involvement. This award was created to recognize a full-time employee who exhibits a servant’s heart and love of Jesus Christ in service to faculty, staff, students and the community. Leslie Ennis, professor and director of graduate admission, additionally serves Samford University as an adjunct professor for Cumberland School of Law. Ennis received the 2017 Cumberland School of Law Outstanding Adjunct Professor Award. He was nominated for this award by law students, and the final decision was made by a committee comprising faculty and students. “We are fortunate to have esteemed team members who have dedicated their professional lives to the improvement of education. We are grateful for their service to the community, Orlean Beeson School of Education and Samford University,” said Jeanie Box, dean.